Does the Olivet Discourse (Matthew 24-25) discuss two subjects, or just one? A critical study! Does the Olivet Discourse Contrast a “Local Judgment” Versus a Universal Judgment? One of the “favorite” objections to a united Olivet Discourse is the claim that the fall of Jerusalem was to be a strictly “localized” event, whereas the second coming of Christ, supposedly foretold in Matthew 24:36f is a universal event. In formal public as well as written debates this argument has been offered repeatedly by my opponents. Like most objections against Covenant Eschatology, it has no substance or merit. Consider a few facts. First, consider that those who make this objection agree that Matthew 24:29-31 refers to Christ’s coming in AD 70. Well, these verses hardly sound local and “minor!” After all, the moon would be turned to blood, the sun would be turned to darkness! Just how localized is this?? Now, those who offer the “local v universal” objection admit that the prediction of the destruction of “heaven and earth” can be and is very often used metaphorically to describe the judgment of nations. So, the question therefore becomes upon what basis does one delineate between the universal sounding language of Matthew 24:29f that is admitted to refer to AD 70, but then turn around and claim that Matthew 24:35 and 2 Peter 3 must refer to something totally different, something literally universal. Now read Luke’s account: “there shall be signs in the sun, and in the moon, and in the stars, and upon the earth (Greek ge) distress of nations with perplexity; the sea and the waves roaring; Men’s hearts failing them for fear, and for all those things which are coming upon the earth (Greek oikoumene): for the powers of heaven shall be shaken” (Luke 21:25-26). So, once again, in a text within the Olivet Discourse, that both Amillennialists and Postmillennialist agree speaks of AD 70, the language certainly is not “localized” but universal. How then, do they determine that other texts that use the identical language must in fact be objectively universal? Presupposition is at work full time here. Jesus said the Gospel was to be preached into “all the world” (holos oikoumene, Mat. 24:14). Almost all Amillennialists and Postmillennialists, when debating with the Dispensationalists, will argue that this prophecy was fulfilled prior to AD 70. So, clearly, once again, universal language is used when the modern sense of “all the world” is not intended. Consider the following also. Caesar commanded that the whole world (pasan oikoumene) be taxed, (Luke 2:1) that was a “universal” law. How universal was it? In Acts 11:28 Agabus said that a famine was coming on “the whole world” (holos oikoumene–the same term as in the Olivet Discourse). Perhaps those who make the “local versus universal” argument should define that “whole world” for us. They could then explain why that “whole world” and the “nations” in Matthew 24:14 has to be a different “whole world” than the judgment of all nations in Matthew 25. In Revelation 3:10 the Lord said a trial was coming on “the whole world.” Do those who make the “local versus universal” argument in Matthew 24-25 believe that this refers to a tribulation that was coming on America? No. They believe this was fulfilled in the first century. Yet this is universal judgment/trial language! 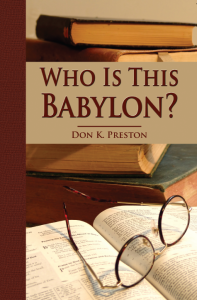 What makes the “whole world” of Revelation 3 less universal than the judgement in Acts 17:31? Finally, consider Matthew 23:29f, where Jesus said that all of the blood, of all the righteous martyrs– all the way back to Creation– would be judged and avenged in his generation! Ask yourself the question: Just how local and restricted was that judgment to be? Those who say that AD 70 was a judgment on just the Jewish nation need to answer the question: Was Abel a Jew? And, was Noah an Israelite? A look at the list of faithful martyrs in Hebrews 11, which encompasses the very martyrs Jesus mentions in Matthew 23 shows that there was nothing localized, nothing strictly “Jewish” about the judgment that was coming in AD 70. For more on the universal nature of the AD 70 judgment, see my book Who Is This Babylon? Our point should be clear. Universal language is used to describe the judgment on Jerusalem. To maintain therefore that the judgment on Jerusalem was local as opposed to some “final coming” that is to be universal is to ignore the Biblical language about the fall of Jerusalem. One final point: was the significance of Jerusalem’s fall local or universal? One could easily admit, for argument sake, that the fall of Jerusalem was local geographically, while its significance was universal! Compare the crucifixion. Was that not a “local event”? Who could deny that? In my (2008) formal public debate with John Welch, Amillennial minister, he produced a chart demonstrating how many miles it was from Jerusalem to Corinth, Thessalonica, etc.. He rather pompously said, to paraphrase: “It was over 800 miles from Jerusalem to these cities! Why would the people in those cities care about the local judgment of a Jewish city so far away?” Even though I had double pnuemonia during that debate and was not on top of my form, it did not take much to point out to the audience the gross illogical of the argument. I got up and took note that it was just as far from Golgotha to Corinth as it was from Jerusalem to those cities! I turned to Welch and asked him if, since in his “logic” distance from an event, and size of an event determines its importance, whether that meant that Jesus’ death on Golgotha had no meaning for those in Corinth or Thessalonica. I asked if that death, which fewer people knew about than knew about the destruction of Jerusalem, had, or has, any significance for us in America, since we are 8000 miles away! When I made the argument, there was an audible “gasp” that swept through the audience, and I witnessed numerous ministers turning to one another and looking at one another with raised eyebrows. CDs of that debate are available from me. Very clearly, the geographical size of an event does not determine its importance. If so, why was Pentecost important? That was pretty local! And yet, it was universally significant, undeniably so. The same could be argued for the fall of Jerusalem. There is no justification for saying the Olivet Discourse discusses a local versus a universal judgment.